The latest leg of artist Eve Mosher’s HighWaterLine project, that works with local communities to visualise the effects of climate change by mapping areas at risk of flooding, launches today in Bristol. A new 32-mile long artwork highlighting the need for flood defences around the UK launches in Bristol today, with the help of communities and neighbourhoods across the city. HighWaterLine Bristol is the continuation of New York-based artist Eve Mosher’s public intervention project that seeks to empower communities in those areas particularly susceptible to flooding as a result of climate change. 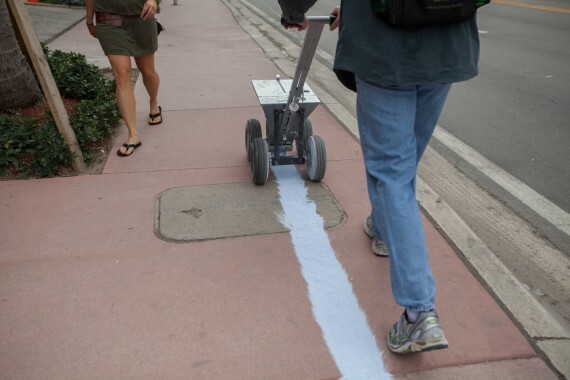 Using a sports-pitch marker, members of the public create a chalk line across their neighbourhood to demarcate the area that would be underwater should a flood surge or rise in sea level hit. In Bristol, neighbourhoods will take turns to mark a continuous line to show the maximum rise in water level should the city be affected. The project launches in the Avon area of the city with the line due to be completed on 21 September. Commissioning body Invisible Dust claim that the resulting drawing will be the largest artwork ever commissioned in the UK. The original HighWaterLine was produced on the New York City waterfront in 2007 when Mosher created a line to mark almost 70 miles of coastline at increased risk from flooding due to extreme weather events. During the making of the work she talked to people she met along the way about climate change and its potential impact. In October 2012 some of the areas she had marked were flooded as a result of Hurricane Sandy. This lead to the first ‘public performance’ version of the work in Miami in 2013 when Mosher coordinated residents to mark out a 26-mile line around those areas that would be underwater should the sea level rise by 3-6 feet. Projects in Boston and Philadelphia are also currently being planned. Bristol was selected as the first UK city to host the project because of its proximity to the Bristol Channel, which has the world’s second highest tidal range.